This series was originally published at the Redbird Daily, but is now proud to call Cards Conclave home. This installment was written by Rusty Groppel. No good list would truly be complete without a nice round of Honorable Mentions. And so I give you some of the fine players that landed just outside of our “100 Greatest St. Louis Cardinals” rankings, as well as some that were excluded because of the time period in which they played. Let’s start with the guys you know. Hemus played shortstop for the Cardinals during the mostly forgettable 1950’s, a decade sandwiched between two very successful runs. In his Cardinals career he would slash .275/.392/.414. Predominantly batting 1st or 2nd, his high OBP served as a table setter for Stan Musial for 7 full seasons. Solly would lead the league in Runs Scored in 1952, as well has HBP in ’52 and ’53. In 1959 he became a player-manager for the Cardinals before ending his playing days. He would then serve as the team’s manager until 1961 when he was replaced by Johnny Keane. Hemus recently passed away at the age of 94. The “Zamboni” was known for his slick glove work at third base. It’s no surprise that he was given this nickname, considering his career began just a few short years after the Blues began playing in St. Louis. He won the Gold Glove at 3B in 1975 but for the rest of his career he was overshadowed by Mike Schmidt (who also entered the league in ’72) who won 9 straight Gold Gloves from ’76-’84. Reitz made his lone All-Star appearance in 1980. He was a glove first player, and ranked 1st in the NL for Fielding % at 3B in 5 of his 8 seasons with the Cardinals. For his career he is 8th all-time in FLD% as a 3B. The “other” Smith in the 1980’s, Lonnie’s greatness flies under the radar as time goes by. In 1982, Smith slashed .307/.381/.434, leading the league in Runs Scored while stealing 68 bases. That season earned him his lone All-Star berth and pushed him to a 2nd place finish in the MVP voting. While he would continue to have success for a couple more years, he would eventually lose his job when Vince Coleman established himself in 1985. Smith was traded to the Royals in May of that year. Perhaps my biggest gripe with the statistical rankings is that McCarver just didn’t quite make the cut. The Cardinals Hall-of-Famer popped up on the top 50 for many categories, but never ranked very high. But take nothing away, he was a great Cardinal. Debuting at the age of 17 in 1959, the backstop would garner 2 All-Star selections and finish 2nd in MVP voting in 1967. The latter would help lead the Cardinals to a World Series championship, one of two during his tenure as well as an NL Pennant in 1968. Though he struggled in the ’67 WS, in the ’64 and ’68 series combined he would slash .400/.500/.660. He led the league in triples in 1966. He ranks 31st in hits for the franchise, as well as 22nd in games played. Though he wouldn’t truly blossom as a hitter until heading to Atlanta, Pendleton was nevertheless a very good Cardinal. Another glove-first 3B, like Reitz he spent some time in the shadow of Mike Schmidt. It wasn’t until Schmidt’s run of 10 gold gloves in 11 years ended that Pendleton would receive the award. He would then win it both 1987 and ’89. He topped the NL in Range Factor at 3B from ’86-’89, and led NL 3B in Total Zone Runs in ’85 and ’86. His best season as a Cardinal came in 1987, helping the team to an NL Pennant while receiving some “down ballot” MVP consideration. A two-sport athlete, and Pro Bowl alternate in 1991, Jordan gave up football when he signed a new contract with the Cardinals in 1992. He would have a successful career in St. Louis, hitting the middle of the order in ’95, ’96, and ’98. He enjoyed a 20/20 season (22 HR, 24 SB) in 1995, one of just 3 Cardinals to do so in the last 25 years (Reggie Sanders ’04, Tommy Pham ’17). A strong season in the middle of Tony LaRussa’s first Cardinals team, in ’96, would earn him looks in the MVP voting and carry the team to the NLCS. His best season came in 1998, slashing .316/.346/.534 with a career high 25 HRs along with 91 RBI and 17 SB. That performance would earn him a nice contract offer from Atlanta in free agency, ending his run with the Cardinals. Templeton is most famous for being traded for Ozzie Smith, and infamous for an obscene gesture towards a fanbase that grown sour of him. As a switch-hitter, he achieved an incredible feat in 1979, collecting 100 hits from both sides of the plate. The first to do so, it has happened only twice in history. A rarity for his era, he was an excellent hitting shortstop. He collected 200 hits twice and lead the league in triples every year from 1977-79. He was twice an All-Star as well as winning a Silver Slugger in 1980. However, he wore out his welcome after ’81 and was traded for a future Hall-of-Famer that would help the Birds reach 3 World Series. 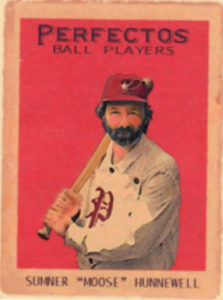 Benes was the Ace of the staff for LaRussa’s inaugural 1996 team. Sporting an 18-10 record with a 3.83 ERA across 230.1 IP, he would end up finishing 3rd in the NL Cy Young race. He followed that with a strong 1997 before signing with the expansion Arizona Diamondbacks prior to the ’98 season. He would return to St. Louis for the 2000 season and find very little success. After struggling in April of 2002 he wouldn’t rejoin the team until July, after the untimely death of Darryl Kile left the pitching staff thin. Again he struggled, his ERA at a lofty 7.06. But following a July 19th trade, newcomer Chuck Finley would teach Benes a splitfinger grip that altered the season. Over his final 12 starts, Benes would go 5-1 with a 1.55 ERA. He held batters to a .210 average and .305 SLG, helping the Cardinals soar to 97 wins. Daffy, the brother of Hall of Famer, Dizzy Dean, was a great pitcher in his own right. Helping the Cardinals win the 1934 World Series, Paul would post 19 wins in each of his first two seasons. Over those two years he would post a 3.40 ERA with 35 complete games, amassing 503 IP. He earned MVP consideration in each of those years, but ultimately arm issues would be his undoing. He would go on to throw just 166 innings over his next 4 seasons in St. Louis. What might have been in the late-’30’s had Dean sustained health and the dominance he showed in his first two years. Back before the Cardinals were the Cardinals, they were the Brown Stockings in the American Association. They became the Browns in 1883, and then everything changed when they joined the National League in 1892. They would then become the Perfectos in 1899, and finally the Cardinals in 1900. When you scour the statistical depths of the St. Louis franchise, Baseball-Reference includes the players from the pre-NL era. The St. Louis Cardinals, however, do not recognize anything prior to 1892. Sorry Ice Box Chamberlain, but you and your ridiculous dead ball era pitching numbers can’t be a part of our 100 Greatest Cardinals list. If the organization doesn’t recognize you, neither can we. But some of the nicknames and stories are great, so I feel obliged to include them here. So here is a shout out to the fine men that played in St. Louis way back when, for the team that would later become our Cardinals. Ice Box Chamberlain – At 5’9″ and 165 pounds, he earned his nickname for either being cool under pressure, or because of chronic laziness. Not because he was the size of a Fridge (which wouldn’t replace the icebox in homes for another 30 years). In 1888 he threw 7 innings of a game right-handed and the final 2 with his left hand. This feat wouldn’t happen in MLB again until 1995. Jumbo McGinnis – At 5’10” and 197, he was also poorly named. He did however post at least 39 complete games and 350 IP in each of his first 3 years of his St. Louis career. Tony Mullane – Nicknamed “Count” and “The Apollo of the Box”, after an arm injury he taught himself to throw left-handed. After his right arm healed, and because he didn’t wear a glove, he would stand on the mound holding the ball with both hands, and pitch with either at any given time. 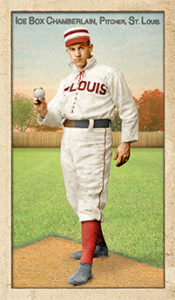 Nat Hudson – Hudson had his best season leading St. Louis to an AA championship in 1888. However, when it came time to play the NL in the World Series, he skipped it to go get married and St. Louis lost. Charles Frederick “Silver King” Koenig – A native St. Louisan, he was named for his a) his silver hair, and b) the translation of his German surname. He threw without a windup and was one of the first ever to use a sidearm delivery. Tip O’Neill – a Canadian OF who rocked a slash line of .435/.490/.691 with an unheard of 14 HR’s in 1887 while achieving baseball’s 2nd ever Triple Crown. That year he established new records in 8 statistical categories. His .435 batting average still ranks as the 2nd best all-time. Dubbed “Canada’s Babe Ruth“, every year the Canadian Baseball Hall of Fame presents the Tip O’Neill award to Canada’s best baseball player. I have yet to determine if he is at all related to current Cardinal and Canadian muscle man, Tyler O’Neill. William “Yank” Robinson – In 1888 he set the MLB record for walks with 116. He then topped it with 118 in 1889. These were also the first years in which the amount of balls required to draw a walk was reduced to 4. Way ahead of his time with the value of OBP, he hit just .219 over those two seasons. However, 234 walks and a willingness to be hit by a pitch made him a weapon with his .389 OBP and ability to steal bases. Arlie Latham – In 1887, while with St. Louis, he stole 129 bases. This figure is not recognized by MLB, but topped only by Hugh Nicol‘s 138 (also in 1887) and Rickey Henderson‘s 130 in 1982. Charlie Comiskey – Nicknamed “Commy” (because of his name, not politcal views) or “The Old Roman”, the St. Louis 1B and player-manager would go on to help found the AL and the Chicago White Sox at the turn of the century. Dave Foutz – Nicknamed “Scissors” because of his lanky frame, he pulled off an unassisted pick-off while pitching for St. Louis. First baseman Charlie Comiskey distracted the runner by playing excessively far off the bag, and while the runner was dancing around watching Comiskey, Foutz raced over to tag him out before he knew what was happening. Jack Stivetts – Nicknamed “Happy Jack”, he doesn’t have any cool stories. He was just a good pitcher, leading the AA in ERA in 1889 and strikeouts, with a whopping 259 over 440 innings, in 1891. Bob Caruthers – One of the best pitchers ever in the American association. He earned the nickname “Parisian Bob” because he conducted a lengthy contract dispute from Paris. He won 40 games twice in his career. His career ERA (2.62) is this lowest of any AA pitcher with 2000 IP. Oh by the way, when he wasn’t pitching he played RF. In 1886 and 1887, he posted slash lines of .334/.448/.527 and .357/.463/.547 as an outfielder. Absurd, Bob. Just absurd.